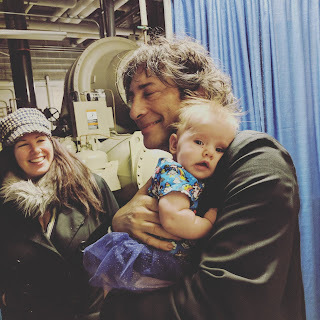 A few months back I heard our friends Neil Gaiman and Cat Mihos were going to be just a couple hours away from us in Ohio. Which meant that not only would we get to see Neil and Cat, but our friends the Scalzis could come as well! I was told to bring baby Evelyn, and let me tell you, this caused some anxiety! Baby! In public! Evelyn is a great baby, but as a baby, I know she can be unpredictable. What if she melts down in public? What if she becomes the worst baby ever and we are two hours from home? How would I handle it? Then I decided, I would handle it. That's how! I don't mind babies in public spaces. I mind babies and children with parents that don't handle it. The ones that don't at least TRY to engage with their children, and just trust that in the cafe or restaurant, their kid will be safe. I had a friend out for dinner with her husband. A small child came tottering up and sat at their table. Oh haha! Cute kid. Then the parent, who was also on a date, came over and PUSHED THE CHAIR IN! As in, my child is now sitting at your table. Please engage her while my husband and I enjoy our date night. I know everyone has these stories. But can't we also remember the good ones? The kid who is fascinated with the fish tanks, so his father plopped them down in front of them while he studied for his bar exam. On days his kid wasn't having it, he would quickly get his drink to go. I've been so tense about going to restaurants, movies, etc. If people are paying to enjoy themselves, I don't want my baby crying to ruin their good time! Then I watched as local brewery Sun King announced they were allowing children, and people melted down. Then I got mad. I want to go to a brewery and hang out with my friends. Why shouldn't I be able to go, just because I have a tiny human? I'M still a human! I want to do human things! Sop we went to the event in Ohio, and Evelyn was a doll. 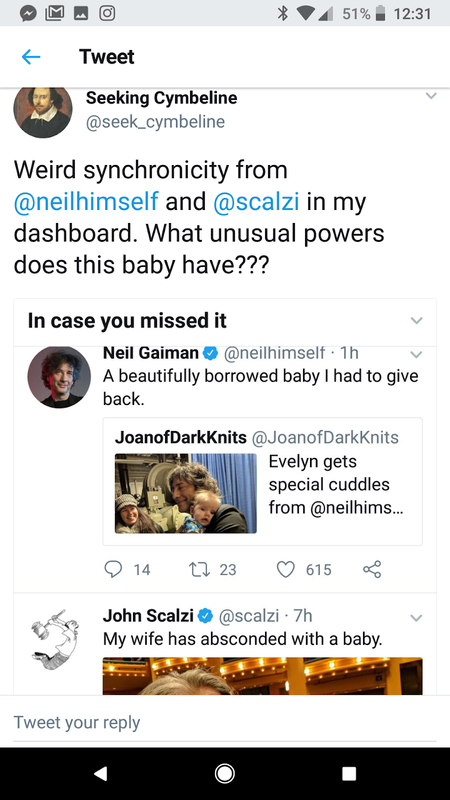 She got her cuddles from Neil, and the Scalzis. We sat in the audience to hear Neil speak, and she fussed, so I took her to the side and rocked her until she fell asleep. Sat back down and listened to Neil talk for a while, then Evelyn let out the LOUDEST fart and dirtied her diaper. I left again, and decided not to go back in since I didn't want to be a distraction for people who had paid to attend the event. Went backstage and hung out with Cat, listening to Neil over the PA. I'm not certain, but I think that she didn't disturb anyone in the audience. No more than someone who might get a dry throat and cough, or sneeze, or an adult who might have to run out to the bathroom. After the event we went to dinner, and I held my baby in my lap at the very fancy steakhouse and wondered if anyone was judging me for having an infant out to a fancy place, and so late at night. Haha! So funny! So cute! Yay! So happy to see friends loving on my baby. I'm imagining the cool kid she's going to grow up to be, and how fortunate we are to have amazing friends like this in our life. There are my worst fears realized. People don't want my baby in public, no matter how well behaved she is. At first I felt sad, then I started feeling frustrated. I want my little human to grow up to be a good human. How will that happen if I keep her inside 24/7 and never expose her to real life, and how to behave in real life? Also, give me a chance before getting mad at the site of a baby! Am I ignoring her when she cries? Is she smelly and I'm refusing to change her diaper, causing the stench to waft over everyone in the vicinity? Or am I attending to her and ensuring that your experience is in no way hampered by her presence? Why not see which scenario is taking place before getting pissy at the idea of a baby in public with adults? Look, I get it. My husband and I are not young. We were together for almost 2 decades before having a kid. I know what it's like to not have kids, and not understand them. But don't hate on the idea of every single baby you see in public! Give them a chance, the same way you give other adults in public a chance. And as a mother, I can tell you that if I do see a parent trying to console a baby while attempting to eat hot food themselves (I've had exactly 4 hot meals since having my kid) or wrangle a wiggly one onto a changing table, I'm going to be the kind of human I want my kid to be. 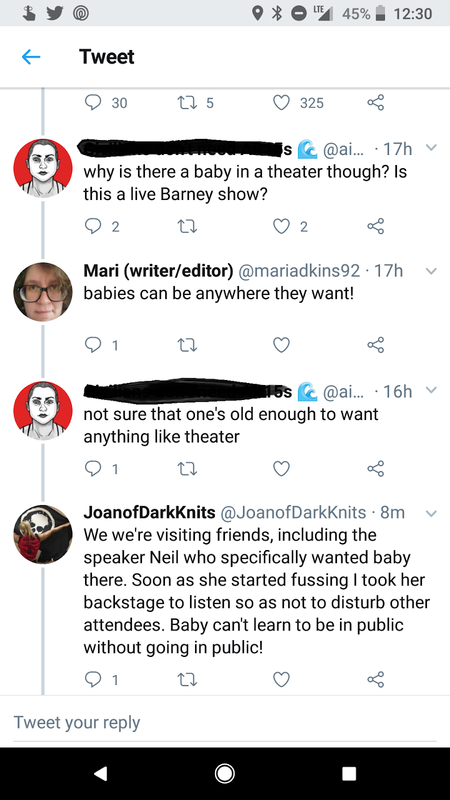 I'm going to offer a hand, not just roll my eyes and think "How DARE they have a baby if they can't do everything perfectly!". Maybe think about doing the same next time, instead of just snapping judgement on twitter? My "babies" are 19 and 16. I LOVE seeing little babies out in public. I've stood by changing tables to make sure baby doesn't fall off so the mom can wash her hands. It sounds like you're doing a fantastic job. On the other hand, I do now find myself getting much angrier at parents who are clearly not even trying. 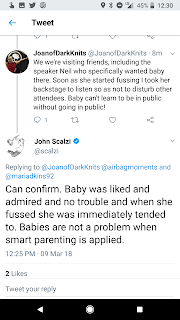 Ask John about his experiences with the “Childfree” Usenet group (I think). Horrifying. Babies in spaces can be very annoying. Some are great, but the vast majority of parents allow their child to scream and cry in any space, anywhere, whether or not people paid to be there or if there is an age restriction to be there. 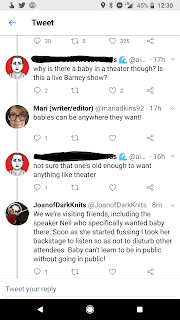 Babies are welcome in most spaces, but in places like upscale restaurants, theaters, bars, etc., maybe parents should wait until they are older. You say how can my child learn, but as a baby, knowing what is and isn't appropriate isn't going to be learned until much later. I don't blame you for wanting to do the things you did without children, but ruining everyone else's evening at the expense of your right to do whatever you want is rude. I don't mind paying more for 21+ experiences because of incidents like a baby being brought to a midnight showing of the remake of The Evil Dead and shrieking through most of it due to the loud chainsaw noises. Some spaces are for adults only and others are family friendly. I get your point, but have you ever read the quote from John Green about paying taxes even if you don't have kids in school? To paraphrase, it's because you don't want a world full of stupid people. Adults only is not a guarantee that you won't have your time ruined. Ever sat next to a table of screechy drunks? Or been in a movie while someone is texting? Adults can misbehave too! It all comes down to parenting. Complain if the parents aren't being responsible, not the second you see someone walk in with a baby! A wonderful example of taking a child into adult spaces the right way. Both those pictures came up on my twitter feed and were delightful. Keep it up. I think babies and small children in public spaces up the stakes. It can be wonderful and it can be horrible; and maybe bits of both at the same time. It won't be boring though! 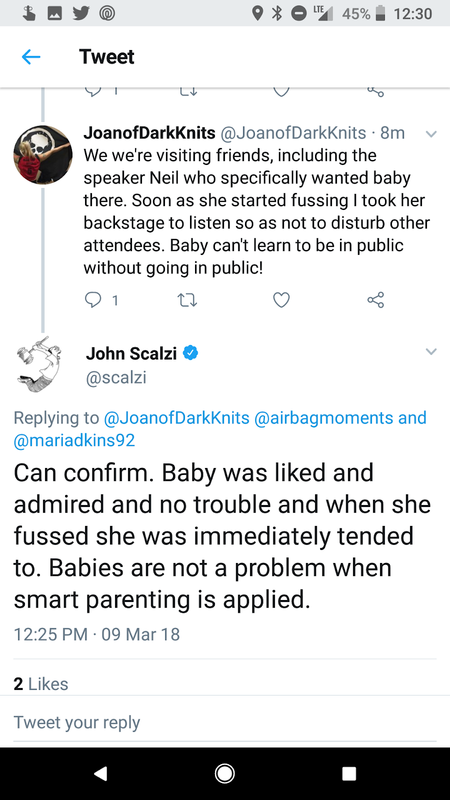 Babies are going to trigger strong responses, and they are going to disrupt the normal playbook. Looks like you and Evelyn gave a number of people a real boost for their evening. Funny how I can witness the experience my friend have here in the states VS the experience I had with my two in Germany (*they are 11 & 9 now). Babies are peoples too. They deserve to be out in public too. Attentive parent's arent the problem. Its people who dont pay attention to their kids, try to pacify them with screens and nit human interactions that i have problems with. Its wild that here in Indiana, if I offer to help people look at me like I have a third eye or will steal their kid. Nope just want to help, because I've been there and it ment the world when I was helped. Sorry some people are dicks. Once they have kids they will understand, at least I hope. We took our babies out with us in their tiny years, their toddler years, and now in their kid years. Both know how to behave in public, how to interact with people, how to order their food (politely even!) from staff, and other things they only could learn by being out in public with us. Have they been perfect? Ha! Absolutely not, but that’s when it’ was our job as parents to adjust and fix the issue. Sometimes we had to leave places early, sometimes it was just a small adjustment. As a result our kids got experiences they never would have if we kept them locked away their entire youths, and they’re always welcomed back to places. Forget the haters and their negativity. You’re raising a good human. Keep up the good work! This is great. Thanks Joan for sharing. Everyone is the perfect parent before they become parents. Whenever my kids acted up in public I felt like all eyes were on me..judging. Guess what? They were and are. You're never going to make everyone happy, so do your thing. I've certainly had moments where I was frustrated with parents for not minding their children, but I've seldom had moments when I thought, "Well, if you decided to have children, a 3-5 year sabbatical from society is just the price you've chosen to pay for said 'privilege'." People can be cruel dipwads. It sounds like you didn't run across any while you were out and being mindful about your little girl's behavior, but faceless jerks on the net will have their say regardless. Nice John Green reference, btw. If you're teaching Evelyn to be a person from a young age, I look forward to sharing society with her.